Rehab-Care supplies the best, safest and most user-friendly products on the market. All our products comply with all current requirements and legislation on Class 1 medical equipment (93/42/EEC). All products are CE-marked. 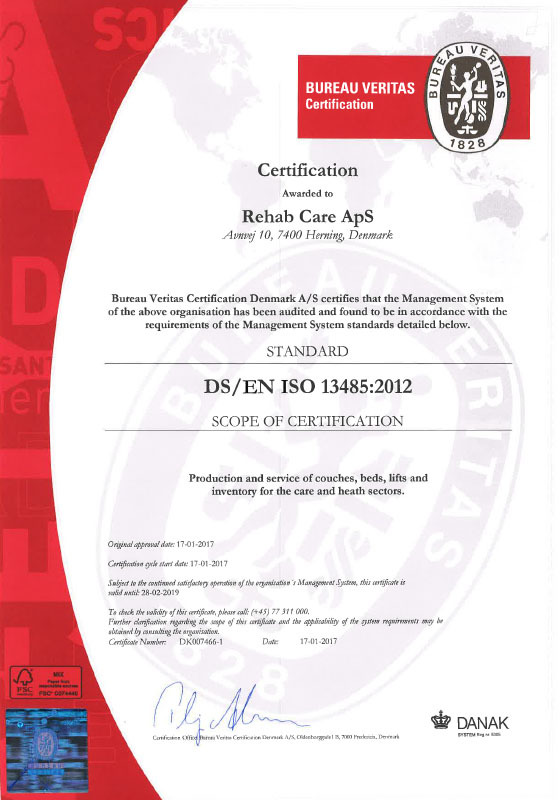 We are certified to ISO13485 (medical standard). All our prototypes are tested in co-operation with the Danish Technological Institute and external consultants to ensure that they live up to our high standards and expectations for our products. Furthermore, our production is subject to a strict internal control procedure which complies fully with the rules of manufacture for Class 1 medical equipment. We are certified to ISO13485 (medical standard). Before our products are introduced onto the market, they undergo safety tests of the entire product life cycle. The aim of these tests is to prevent and eliminate risks to users as well as staff. The risk analysis is prepared and updated on an ongoing basis according to the standards in ISO 14971. Furthermore, we have an active market monitoring system which provides extensive knowledge about client requirements for both user-friendliness and safety. The products comply with the requirements of the medical directive for Class 1 products (MDD 93/42/EEC). We focus on the environment and user safety. 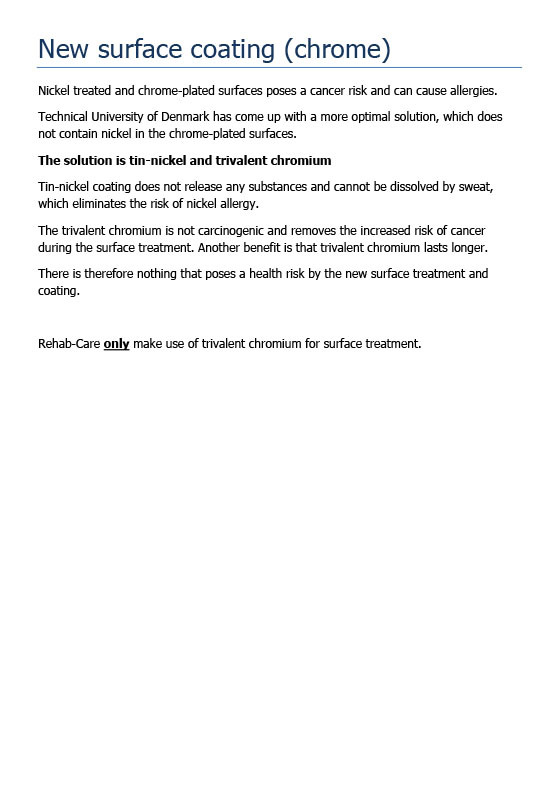 We use a trivalent chrome plating process which does not constitute a risk to staff or the environment (nickel-free). 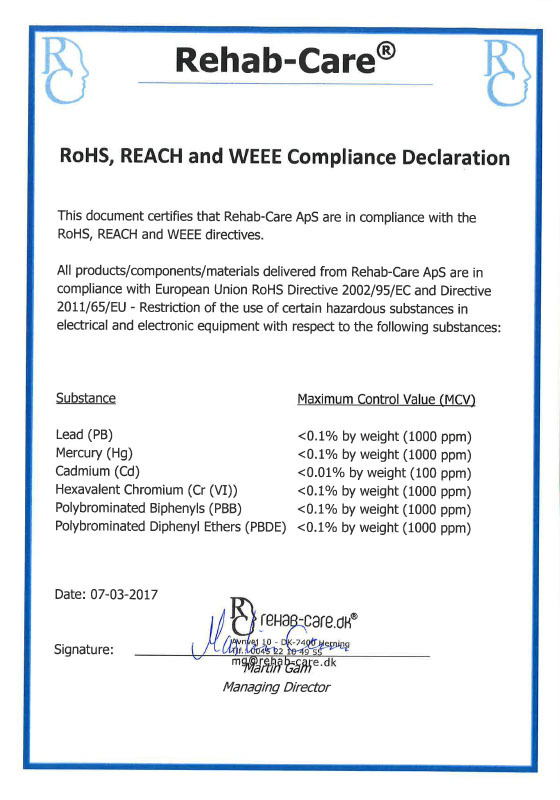 We observe all requirements in the RoHS Directive. 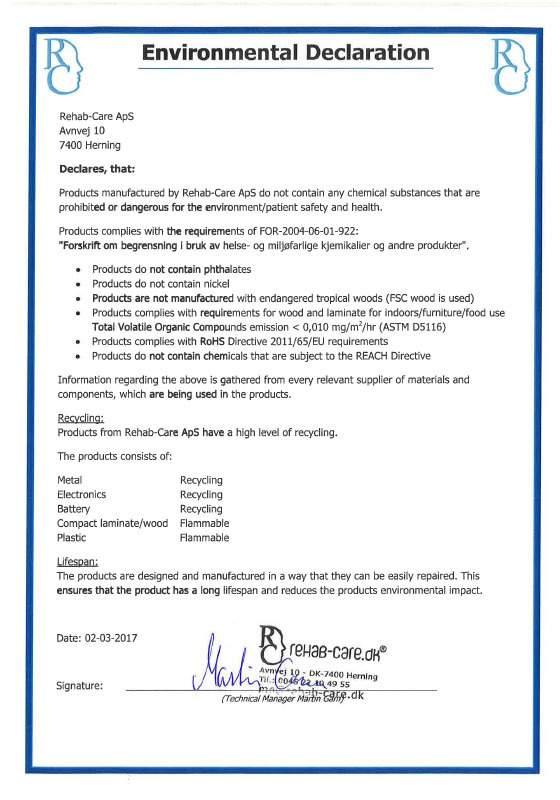 Were are registered as a manufacturer with the Danish Medicines Agency.